What the forces that would sway popular American music to only focus on youth fail to regard is where simply the tone of a voice and the visage of a legendary performer can evoke such a reverence and place such immeasurable weight of an entire remarkable career behind it that an immediate elevation of whatever music being performing occurs in a measure that could never be challenged by the simple exuberance of youth. 2014 has been a retrenching of sorts for many of country music’s legacy artists. Dolly Parton and Billy Joe Shaver have released albums after multi-year hiatuses from the studio, and to high praise and successful chart performances. The release of Johnny Cash’s lost album Out Among The Stars treated classic country fans to an entire album’s worth of unheard material and collaborations with stars who’ve passed on, including Waylon Jennings and June Carter. 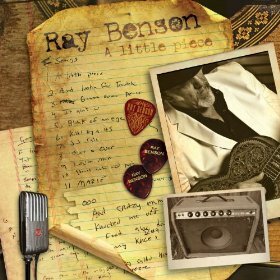 The song “It Ain’t You” off of Ray Benson’s album A Little Piece continues this trend of offering both something unheard, but something wrought during the living era of a legendary artist, and paid forward with reverence and care by those still around who are inspired by their legacy. Originally written by Waylon Jennings with Gary Nicholson, “It Ain’t You” was never recorded, and was relatively unknown except to a select few for many years. When Asleep At The Wheel frontman Ray Benson was looking for material to release on his first solo album in a decade, the song was suggested to him by Sam “Lightnin'” Seifert who co-produced the effort with Lloyd Maines. 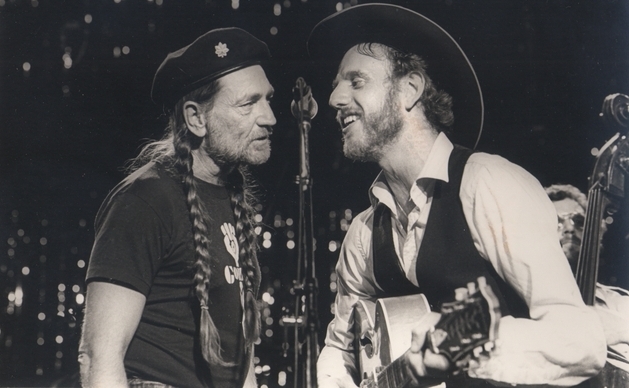 Benson was blown away that nobody had ever recorded the “undiscovered gem,” and he called up Willie Nelson who agreed to do the song with Ray. Willie recorded his part in his Western ghost town of Luck, TX. With Ray being 64, and Willie being 81, but both performers being very much in charge of their faculties and charging forward with their music careers, the pairing was perfect to embody the theme of “It Ain’t You” about growing old but staying young. “It Ain’t You” is exquisitely written, and makes one wonder how this song went unheard for so long. It has the similar self-reflective and age-recognizing tone of other Waylon-performed songs like “Memories of You And I”—pondering one’s own mortality and how age sees the sifting of abilities through your fingers. At the same time there’s a defiant strength woven through the lines; a reassurance that even though wrinkles may appear on the surface, the soul of a man continues to become refined over time. The music, and both Ray Benson’s and Willie’s performances are chilling enough, but the video for “It Ain’t You” takes it a step further, fully understanding what’s at the heart of the song, and pulling out all the stops to not only do the song justice, but enhance the experience through the visual medium. The wisdom of knowing what the simple sight of Willie’s battle-worn hands can stir in the beholder, while crafting a way to capture the spirit of the long-time friendship between Ray and Willie so purely is worth watching even if the song itself doesn’t strike a particular chord with the listener. Even without the legacies of Ray Benson, Asleep At The Wheel, Willie Nelson, Waylon Jennings, and Gary Nicholson behind it, “It Ain’t You” would still be a song for the ages. Like the song’s writers, caretakers, and performers, it is destined to grow in stature over time. This is the kind of ‘mature’ music we’re deprived of by youth-targetted marketing . The reason , of course , is not that these songs aren’t wonderful …but because an older demographic doesn’t BUY in the same impulsive way that young people do -iTunes downloads ,movie tickets on line ,using debit/credit cards at McDonald’s , T-shirts at concerts etc… AND because , with exceptions of course , an adult demographic does not have disposable entertainment income ..particularly in these times … There are still mortgages to deal with , insurances , kid’s education , vehicles , home maintenance …and on and on . Advertisers have to throw their support behind a product that garner’s attention – like Luke’s teeth . Disagree about your point regarding disposable income. Middle-aged people earn far more than young people, especially now in the recession when vast numbers of young people are unemployed or working only part time. Couple that with the huge student loan debts many young people have to pay off, and you find that the disposable income of middle-aged people is far greater than that of the young. Having thought through this problem, I think that the biggest issue here is the music industry’s increasing reliance on concerts, due to the drop in recorded music sales. Concerts primarily serve as socializing events, and hence disproportionately attract people interested in loud partying. This could explain why most of the mainstream country music today has become so loud and beat-heavy, with party-based lyrics. As a side effect, the reliance on tours also means that artists need to meet a certain level of physical attractiveness. The reason the music industry focuses on youth is to entice advertisers who want to target young consumers who will show brand loyalty throughout their lives. Older consumers are already more set in their consumer habits. Exactly , Trigger . I used to be in the art business , somewhat . Older folks aren’t big art buyers ( unless their last name is Gates ) . They tend not to collect or gather ‘stuff’ after a point because they have it all…walls and houses are cluttered with stuff they want to get rid of ..including records and CD’s ( just check out neighborhood garage sales ) . Young people go to the shows , buy tickets , merchandise, download songs and albums from a phone , online etc.They are still in the ‘collecting’ phase of their lives . Owning ‘stuff’ is more meaningful ….music included . Older folks don’t purchase entertainment that way…or as often as young folks …and as Eric points out , they don’t attend shows as regularly . Its too expensive and too much of a hassle driving , parking , crowds , noise etc. Its completely understandable that from a business aspect , marketing to a younger demographic is the only way to go . And yes…if you treat them fairly you will cultivate a lifelong customer . A car salesman once told me ” I don’t want to just sell you a car …I want to sell you EVERY CAR YOU BUY for the rest of your life “. Goosebumps at two lines in. What a classic country song brought to life. Wonder that no one ever touched this before! There is a lot of buried treasure like this one around, but not a lot of Waylon’s stuff that hasn’t been recorded. This is a jewel. Willie and Ray give it the respect and care that it deserves. A sweet classic. Thanks for putting us onto this, Trigger. If I was drunk, I’d bawl my eyes out to that one. I wish they’d’ve countried up the arrangement more, but it’s still a great song. This is a truly gorgeous song, with near perfection in both lyrics and melody. It definitely should be a contender for Song of the Year. WOW. Haunting…this type of song proves that the time here on earth/life, was just a stop in the journey of forever for a guy like Waylon. Can’t write a song like this without true experiences….the verse about “the freedom of youth is wasted on the young.” My goodness. How true is that? Just look at the freedom and opportunity the “young” have in country music today….and the waste of it. Thanks for the song Waylon and thank goodness Ray and Willie recorded an nobody else.